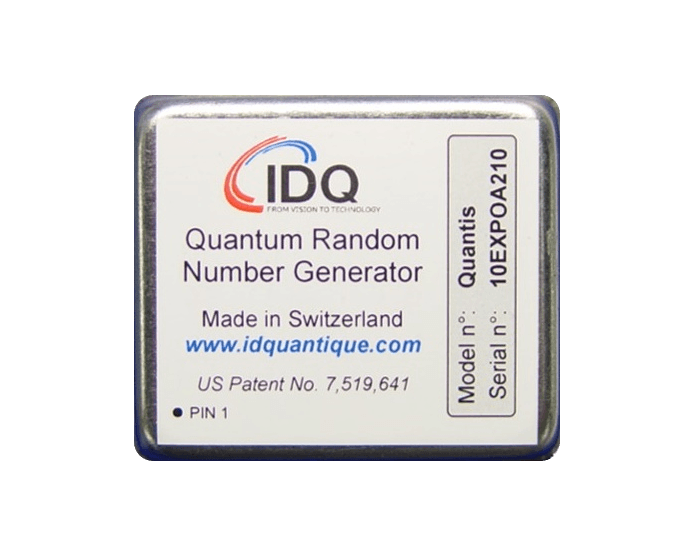 Quantis is a true random number generator (RNG) exploiting an elementary quantum optics process which provides high-quality true randomness. The Quantis-OEM component has been designed for mounting as a hardware random number generator on a printed circuit board for companies designing embedded systems. The output pin DATA_OUT provides a random bit stream at an average rate of 4Mbit/s. The output pin DATA_CLK indicates a valid bit on DATA_OUT. A pulse is also present on output pin DATA_STROBE every eighth DATA_CLK pulses. It allows users to latch an external shift register (see application note). The output pin STATUS is at a logical high level under normal operation. In a case of system failure, it goes to low level and the bit stream is inhibited. When input pin SHDN (shutdown) is at low level, the module is stopped and power consumption is reduced. SHDN is also used to reinitialize the module if STATUS is at low level. SHDN should be left open if not in use. MODULE_DETECTION is always at low level. It can be used to detect the presence of a module when several modules are used in a circuit.